*This does not include my husband, who does not like scones, berries or their dried counterparts, nor ginger. He can save room for turkey. I make these quite small for small hands, and this reduces the baking time slightly. Feel free to play around with the types of dried fruit. Oven to 375. Beat egg with 1 tbsp milk. Line baking sheet with parchment paper. Place the cubes of butter and the flours, baking pwder, and salt into a bowl. Mix butter into dry ingredients with your fingertips until the mixture resembles fine breadcrumbs. Add sugar, ginger, and dried fruit. 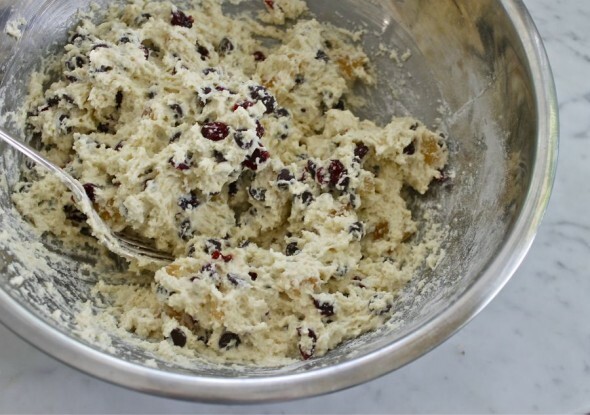 Make a well in the center of the dry mixture and add vanilla and just enough milk to make a soft dough. If too sticky, add a bit more flour. If you want rustic scones as pictured, break off small clumps and bake. 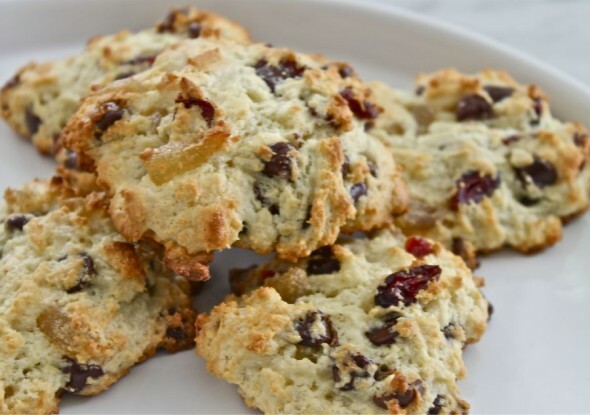 If you want traditional scones, place onto well-floured board and pat out until about 3/4" thick and cut into wedges or use cutter for rounds. Place on the baking tray and brush with beaten egg and milk mixture. Bake near top of the oven for 12-15 minutes or until golden brown and well risen. Cool before eating.